Doug’s experience as an expert witness has given him the insight about what you want and need in a reference book. In a book brimming with information, Doug provides a clear, concise explanation of appraisal theory and methodology without the “filler”. Every detail of this book was planned with you in mine. Even down to the detail of locating the index at the beginning will make this the most efficient reference book in your office library or your E-library. 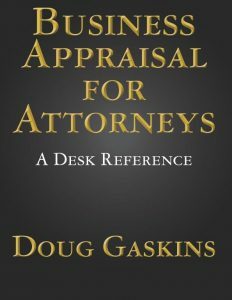 This book will be YOUR “go to” guide for business appraisals. click book cover or here to purchase.